What are you doing around my wives? … keep your chickens healthy and not break the bank. It’s easy to manage the first, and commercial egg farmers do it all the time. Crowd the birds into a small space so you don’t have to spend a lot of money on buildings, heat or ventilation. You do, however, have to spend money on antibiotics to keep the birds from getting infections, and cut the ends of their beaks off to prevent cannibalism. Use lights to increase laying. Feed commercial feeds. Get rid of your older chickens the minute egg production drops. It’s not so easy to manage numbers two and three — hence the point of this post. Future chickens, eggs, chickens, eggs, etc. Not being a commercial egg producer, I do it a bit very differently. Let’s start with housing. In a small flock, you can give the birds extra space. Somewhere around 10 square feet is a good number (battery chickens get 2 square feet or less). That means you could put two dozen adult chickens in a 10- by 24-foot pen. Although many tout the wonders of free-range chicken and eggs, I find chickens do just fine in confinement. The key is to provide deep litter (I like straw). The chickens will scratch in it, turning over the litter and adding their droppings. Every so often, you clean out the coop/pen and put the used litter on the compost pile. The chicken coop need not be fancy. Mine is a recycled wooden pump house with a dirt floor. I use old plastic five-gallon buckets for nest boxes. Extra space lets your cluckers get exercise and sunlight. The large pen allows them to maintain a pecking order without killing each other (which they will if you crowd them). A good secure pen also protects them from marauding neighbors’ dogs, foxes and raccoons. My pen is under a live oak tree, which also keeps them safe from hawks and eagles, of which we have a fair number. When I’ve tried to free-range chickens, I’ve had much more trouble with aerial predators than the four-footed variety. Next, the matter of food. Chickens will eat just about anything (mine turn up their noses – err, beaks – at citrus peels, but that’s it). Although we feed grain screenings, they also eat food scraps from our tables and that of the local school, milk byproducts (mixed in with the grain screenings), scraps from butchering, chicken balls, garden weeds, hay, ground squirrel carcasses, bugs and worms they find in their pen. We feed them crushed eggshells for calcium, and very occasionally I toss in a handful of oyster shell. Take extra care to feed them well during the winter. Chickens are pretty hardy, but in cold weather, they’ll use up more calories staying warm — which cuts into egg production. The key for top-notch egg production is to make sure they get enough protein. Since I have a milk cow, my chickens get a lot of their protein in the form of cheese, yogurt and clabbered milk. I also mix in bacon grease for extra fat. When I’m raising baby chicks, I give them chopped hard-boiled eggs, which supply both protein and fat. Chickens should also have plenty of clean water available 24/7; if they’re dehydrated, egg production drops. Green stuff is particularly important for chickens in confinement. We feed alfalfa hay to our old stallion and the milk cow; the leftovers go into the chicken pen. Chard, collards and beet and radish leaves are also excellent for this purpose (you can eat most of those yourself as well). The nice thing about chard, especially, is that it will grow pretty much year round (at least in my zone 7 climate), so it’s a readily-available source of fresh green veggies. 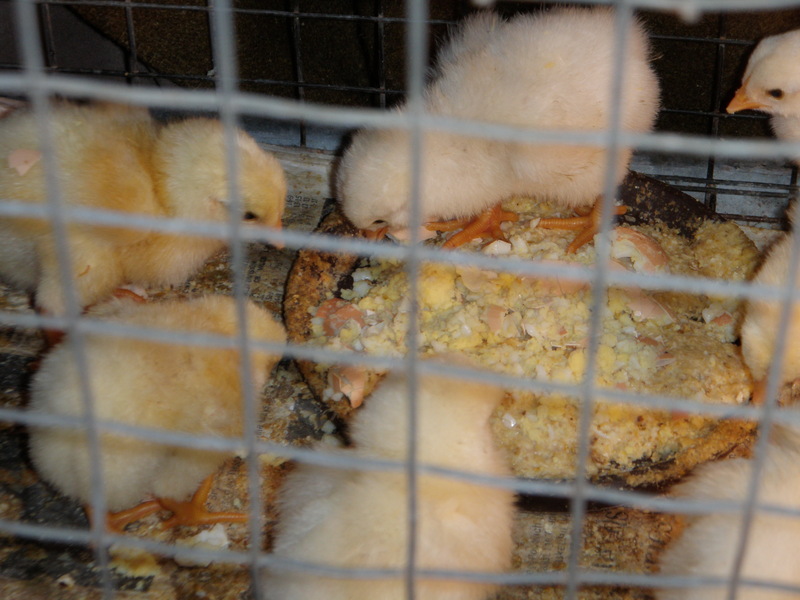 Breed choice affects egg production. Leghorns, for example, are great producers. However, they’re flighty and totally disinterested in setting on their eggs to make more chickens. From a commercial viewpoint, that’s good, as a setting hen quits laying for a while. Since I want a sustainable flock, I prefer old fashioned breeds. They might not produce to quite the same level, but they’ll raise next year’s flock. In my experience, Australorps, Buff Orpingtons and Barred Rocks are good choices for both egg and chick production. The hens won’t all set, which is fine – that way some will produce eggs and some will produce babies. I can also use the incubator as a backup. 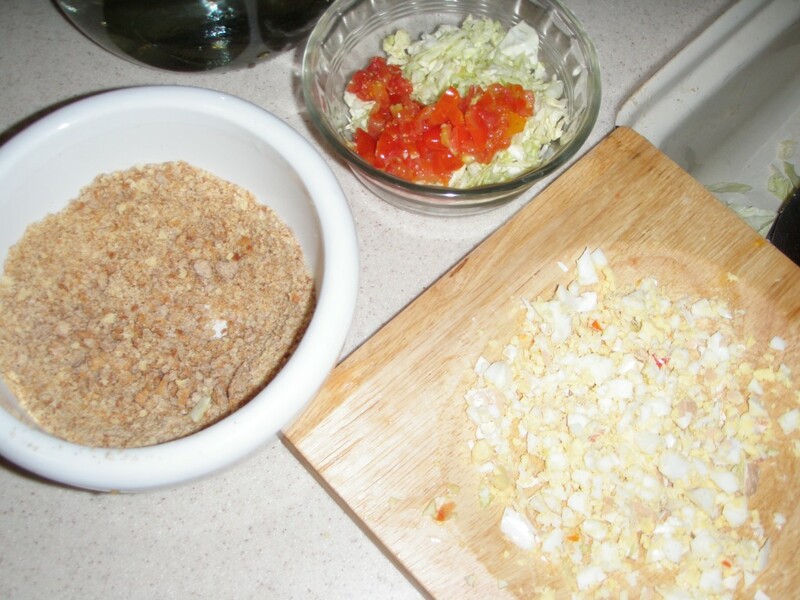 “The makings” for chick food — chopped veggies, dry bread crumbs, hard-boiled egg. The final key to maximizing egg production is cyclical management. 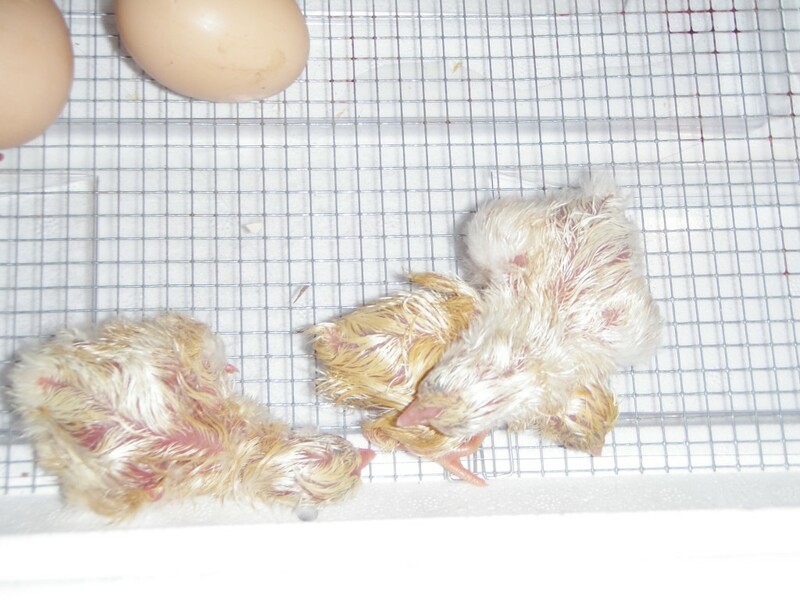 A hen usually starts laying at about 18 to 22 weeks of age. Breeds vary – this year’s Barred Rocks started laying six weeks before the Australorps, even though they were hatched the same day. Egg production peaks about six to eight weeks later, with around 90 percent of your hens laying once a day. 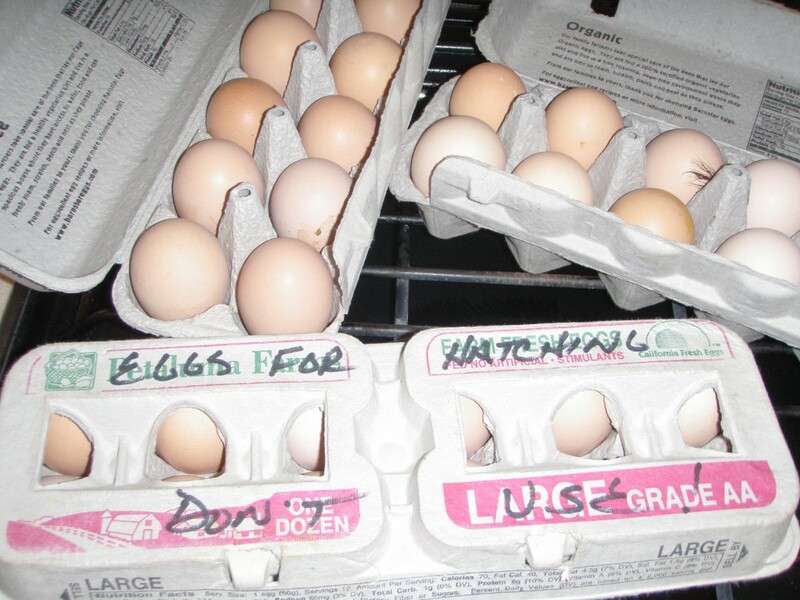 By the 12th month of lay, the hens will drop off to around 65 percent of their peak production. So if you have 12 mature hens, you can expect around 10 eggs a day six weeks after laying starts. By one year, you’ll have around 6 eggs a day. I will add a caveat, however. Those numbers are for commercial chickens, not home flocks. With good management, you may get more eggs, especially from older chickens. The key is to keep new hens coming, so as egg production drops for older hens, the young ones are starting to lay. Let’s say you’ve started your flock in June. By November or December, your hens should start to lay. With luck, you’ll have hens setting eggs by March or April. Select replacement hens from those hatches – they’ll start laying in the early fall, about the time the older hens have slacked off. You can butcher the senior hens for chicken soup once the young ones come into full production. Some people cull older hens at 18 months — even if they’re still laying — because they feel the amount of food going into the chicken is too high for the number of eggs that result. With 12 older hens and 12 younger hens in the pen at all times, you should be able to count on a minimum of a dozen eggs a day all year round. In most families, that’s more than enough eggs, especially considering that eggs store very well under refrigeration. This entry was posted in Farms, Food, Health and tagged Australorp, Barred Rock, Buff Orpington, chickens, chicks, eggs, flock, Leghorns. Bookmark the permalink.